This little piece of fabulousness is the work of Meredith Clowdus…she describes her art as a part of history. And I totally love it. Wanna know a little bit more about this “Farmer’s Rancher’s Trophy Wife“?! “My name is Meredith Clowdus from the hill country area of Central Texas. I live on my family’s ranch with my husband and three kids. Aside from my sweet little family, I have four things dear to my heart. The first is my vegetable garden that I tend to daily with Saige, my two year old daughter, and my father. Second are my hens that lays beautiful green and blue eggs for me faithfully, everyday. Third, is treasure hunting on my family ranch. My family and I live on a working cattle ranch that has been in my family for 7 generations. Through the late 1800’s and early 1900’s, wagons traveled along our creek, heading west, leaving treasure behind to be found generations later. 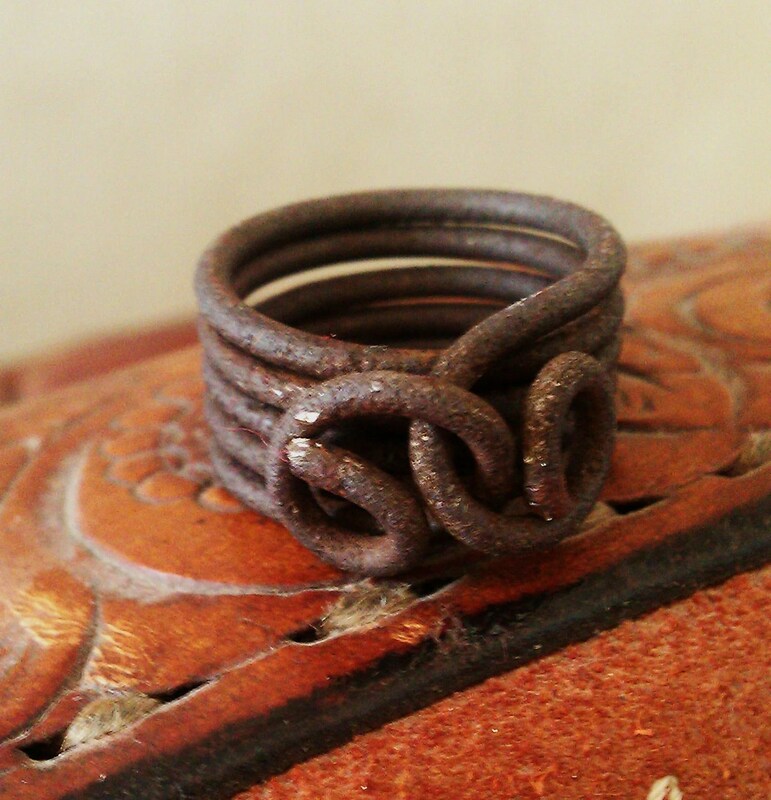 And finally, silver and gold artisan jewelry. I fell in love with silver and gold when I was 12 years old. My mother owned the local flower shop and next door worked the most incredible jeweler. I pattered around the jewelry store everyday after school sweeping, dusting, stringing pearls, and standing over the jeweler as he torched, carved and manipulated silver and gold. I was in love…and hooked. 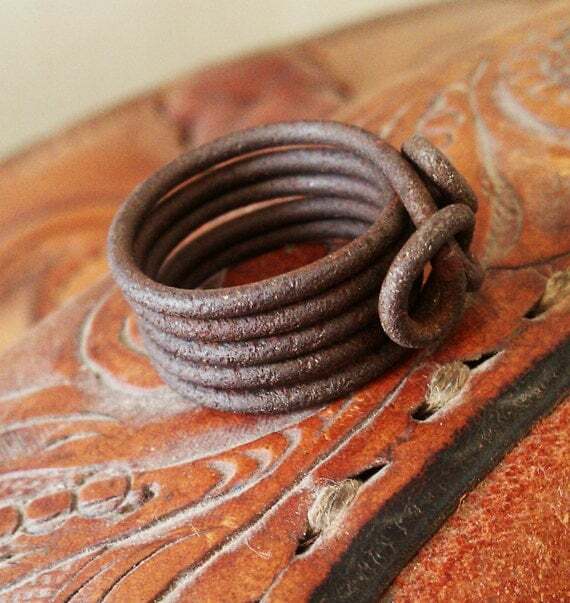 These day, I design and create jewelry made of vintage ranch wire and silver, bronze and gold. 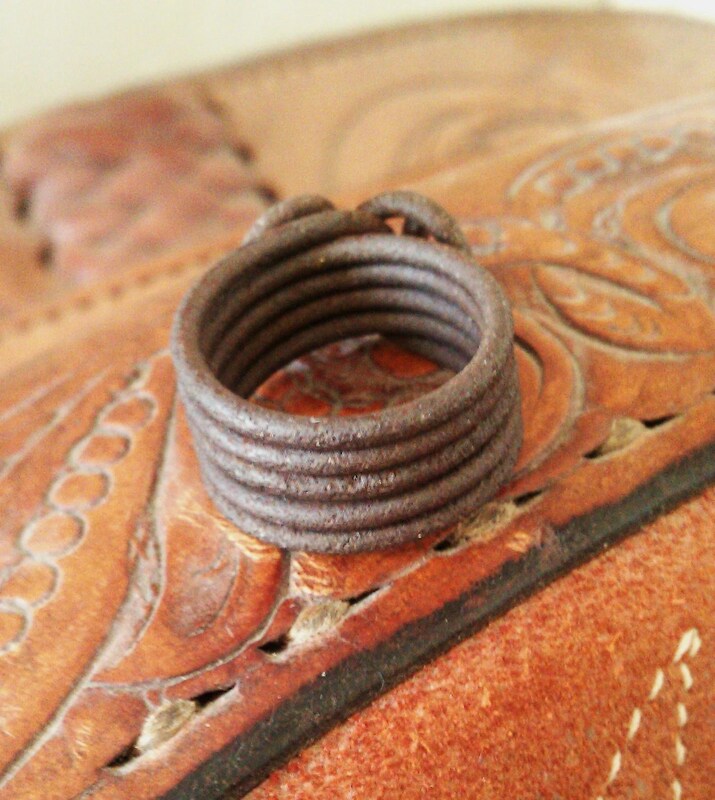 Many jewelry pieces include treasure I’ve found on our ranch. Also available in my store are singular items I’ve discovered digging through our barns, in our cattle pastures or in caves nestled against our back fence. I was sooo excited to find this darling and her art, and then she has offered to give one of these rings away to one of you lovelies!!! 1- Visit Meredith’s etsy page, check out all her goodies and come back here leaving my a comment letting us know your favorite item and why! 2- Visit Meredith’s Facebook page, “LIKE” her, tell her I sent ya and then come back here leaving me a new, separate comment letting me know! 3- Retweet, facebook or blog about this giveaway and leave separate comments telling me so!! Contest will run from today (April 23) to midnight Monday (April 30th), draw will be made via random.org and announced here! Love the wire and sterling silver beehive earrings!